Since the late 1990s, people around the world have used social media networks to share their ideas and connect with friends. People from all walks of life, including the military, use social media to band together and form online communities. However, social media also became a place for people to vent their frustrations and express strong opinions — sometimes with negative repercussions. Senior Airman Devin Rumbaugh, 86th Airlift Wing public affairs photojournalist, checks his social media feed Feb. 7 on Ramstein Air Base. 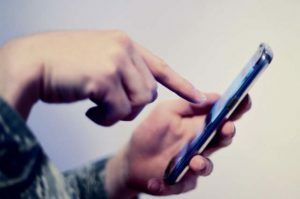 Social media is a popular tool for military members to connect and share experiences. This is why the 86th Airlift Wing legal office reminds Airmen and their families to remain professional at all times, whether they are in the real world or on the world wide web. While military members have plenty of leeway with what they can say in a public online forum, specific Air Force Instructions exist that govern Airmen’s conduct on the web, Widener added. According to AFI 1-1, Airmen must refrain from posting information that is offensive, disrespectful and harmful to good order and discipline. If social media users expressing their opinions can be identified as Airmen, they must also make clear that their opinions are solely their own and not of the Air Force. Airmen in the past have faced disciplinary actions because content they posted on the internet adversely affected their units and put the Air Force in a bad light. Senior Airman Danielle Abbey, 86th Airlift Wing military justice paralegal, said it is important for Airmen and Air Force standards. Abbey added that the variety of punishments for misconduct online are as broad as the kind of content Airmen post. Disciplinary actions can range from verbal counseling to court martial, she said. In addition to maintaining the Air Force’s good image, Widener said that Airmen must also be mindful of operational security when posting information online. He used the example of a puzzle in which someone can use little pieces to build a big picture. Information shared within a closed group can also be leaked to outside users, he added. Both Widener and Abbey acknowledged social media as a positive tool that Airmen may use for communication, morale and even recruitment. They added that the regulations imposed upon social media use in the Air Force should not deter Airmen from enjoying their favorite online content.